Server admins, have we got great news for you. 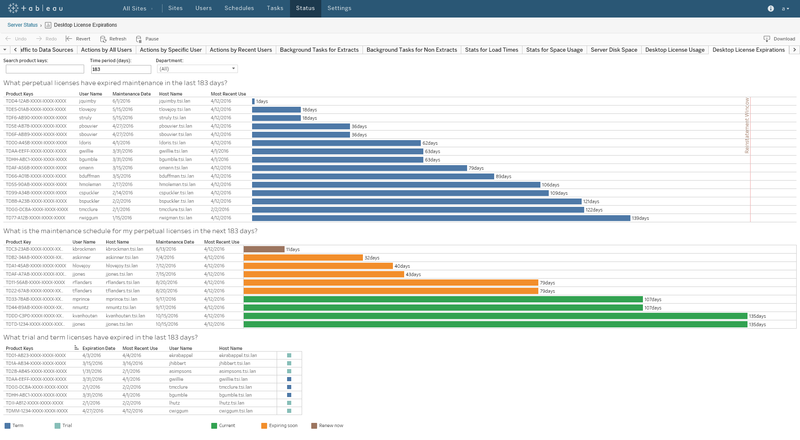 Tableau 10 includes several new features to help you configure and manage your deployment with ease. We’ve added new features to give administrators and IT more control over Tableau Server deployments and upgrades. Let me tell you about them in detail. In Tableau 10, we’ve improved the upgrade experience and reduced user downtime. You no longer need to manually uninstall the old version of Tableau Server through the Control Panel. Instead, simply launch the new Tableau Server 10 installer and we’ll take care of the rest. We’ve also added the option to uninstall without making a full backup. The backup for large server installations used to take up to several hours, leaving users without access to the service. Now, as long as you’ve taken a recent backup of the server and feel comfortable relying on this backup for rolling back, you can skip taking a full backup during the upgrade to save time. Tableau 10 includes many stability improvements for Tableau Server. For single-server installations, we’ve made Tableau Server more robust to issues during periods of high-disk IO latency. Tableau Server requires three nodes for HA, yet we previously allowed customers to configure failover and replication with two nodes, causing customer confusion. For two-node installations, you’ll now be limited to a single instance of the repository. If you need failover or high availability with a second instance of the repository, install Tableau Server on a cluster of at least three nodes. This way, you can configure two instances of the repository and gain the benefit of an automatic failover. We’ve also reduced the overall memory usage of the Tableau Server processes to improve performance. In Tableau 10, you can enable use of shared Tableau Server environments with larger sets of users with diverse authentication needs. This might prove handy if you’re dealing with regulatory reasons at financial institutions, looking to share Tableau insights with your partners, or working to make Tableau a part of your product. With this new feature, you can set up single sign-on for Tableau users through different SAML 2.0-based Identity Providers on each site. This essentially enables seamless access to Tableau for users from different departments or even different organizations. And for IT, it reduces management overhead to one shared server deployment. Tableau Server administrators still have the control and visibility as they’ll enable site-specific authentication across the server. And site administrators are empowered to manage if their site needs a different SAML Identity Providers to authenticate users. To learn more about how to set up site-specific authentication on your server, check out this Online Help guide. We’ve added a new feature to give organizations a complete view of all internal users of Tableau Desktop. That means all instances of Tableau Desktop must be configured to send the information to Tableau Server. If your organization packages Tableau Desktop or uses a software-deployment technology, we give a command-line option to set the Tableau Server information at install time. For all desktop configuration options, please see this Online Help guide. Once configured, Tableau Desktop sends usage information to Tableau Server in the background every eight hours, server login not required. Because the information is sent unauthenticated, the feature is off by default. Refer to this Online Help guide to turn it on using a tabadmin command. We highly recommend SSL on Tableau Server to secure the communication. Tableau Server stores the received information in the Postgres repository, in a table called DesktopReporting. 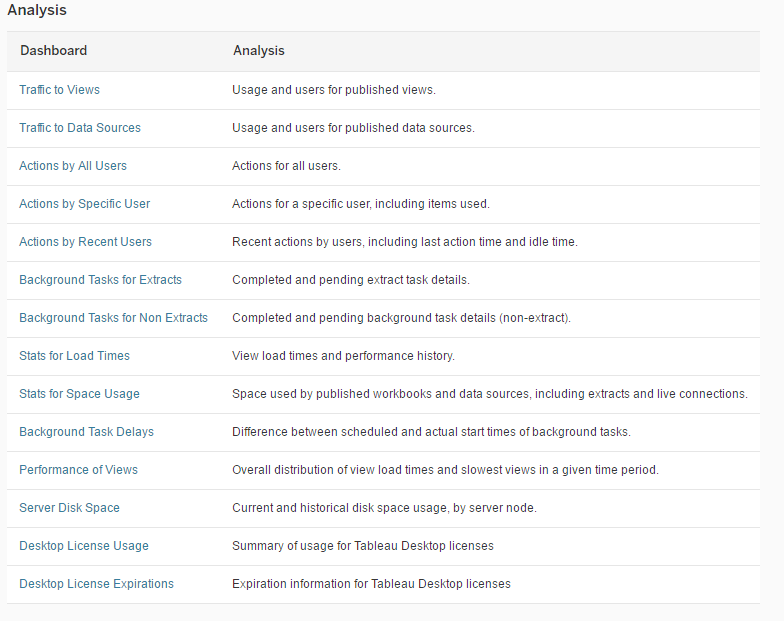 We’ve added two new administrative reports on Tableau Server. Admins can find them under Server > Status. This view answers questions on who is actively using Tableau Desktop. The summary view on top shows you how many desktops are in use. And the detailed views give you real-time information on which user on which machine is actively using Tableau Desktop. We show the associated license-key information for perpetual (master key or named user), trial and term-based keys. 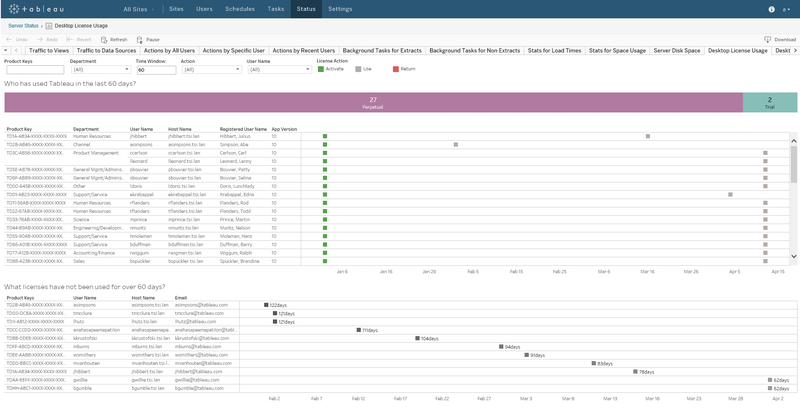 This administrative view shows the Tableau Desktop licenses that have already expired. It includes term keys and trials. For perpetual licenses, this information appears in the reinstatement window. The view in the middle helps you plan your maintenance renewals and also verify that the renewals were successful. We've also updated our Tableau Server hardware requirements. Most notably, we are discontinuing support for 32-bit Tableau Server for Tableau 10 and beyond. You can also install Tableau Server on 2-core machines to test a proof of concept. We recommend a minimum of 8-cores for any production environment. Check out our hardware requirements page to learn more about all the changes. We’re thrilled to bring you these new features, and we’d love your input. As you know, we strive to partner with both the business and IT to enable self-service analytics at scale. And we’d love to hear what’s working and what needs improving. We have a timeline for getting Tableau 10 out the door, but we’d first like to get solid usage in beta and fix any bugs. We want your feedback as early as possible to catch any issues and ensure the new features are great. Please join the beta program and let us know what you think. Sizing the Tableau server 10 for handling real time loads is not given . Where can I find the documentation. I didn't know the Simpsons worked at Tableau.